As European directives drive ever more stringent consents for phosphorus removal, utilities are seeking technologies that can remove phosphorus from wastewater to the new lower levels required. However, achieving this economically with conventional technology is a challenge and innovative new solutions are required. To help address the problem wastewater technology specialists Jacopa are making a pilot-scale, Fluidyne FFP™ fixed plate cloth media filter trial unit available to water companies and others who wish to evaluate the technology through a site-based pilot trial. Cloth filters are recognised internationally as an ideal solution for phosphorus removal in wastewater treatment works, and have a wide range of further applications including the removal of tertiary suspended solids. The Fluidyne cloth media filters feature an innovative fixed panel design that uses simple gravity to produce filtration and backwash flow. The high performance, low-operating cost, cloth media filter is suitable for tertiary treatment for both large and small wastewater treatment applications. Their popularity is due to a combination of factors including ease of operation, simple maintenance, cost-effectiveness, robustness and reliability. The filter requires no internal or submerged moving parts; so much of the mechanical complexity, maintenance, and costs that arise with other systems is removed. The exceptionally low cost of media replacement is a particular advantage. The chemically resistant acrylic cloth media is supplied in flat sheets, requiring no stitching or fabrication and is simply clamped to the cassette frame with no specialist tools required. This simple design reduces replacement media cost, lead-time and maintenance. The F160206 trial unit will remove suspended solids (and the associated BOD) from domestic and industrial wastewaters. The unit will treat flows of up to 6 l/sec to a 95%ile 10 mg/l BOD, 10 mg/l SS quality. Phosphorus removal is achieved with the addition of a ferric dosing system. The unit is supplied in two parts; a main treatment tank with valves, instrumentation and control panel pre-installed and a compressor skid, which includes an air dryer, pressure regulator and air filter. 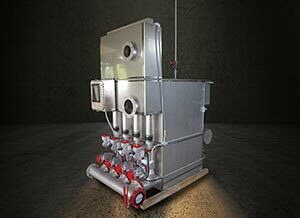 The F160206 unit has two filter elements installed in the stainless steel treatment tank. Each filter Element has two rectangular, acrylic cloth panels clamped onto a stationary framework so that the pile of the cloth is on the inside of the element. Suspended solids collect on the pile of the cloth on the inside of the element. The clean, filtered effluent collects in the filter’s main tank before leaving through the outlet flange. As solids accumulate on the pile surface inside the element, the flow through the unit is restricted causing the water level in the influent channel to rise. A high level float switch in this channel is used to initiate a backwash cycle. Each filter element is cleaned in sequence by simply closing the inlet valve and opening the backwash valve associated with the element. This allows gravity to force flow in reverse through the cloth panels, dislodging the accumulated solids and allowing them to drain from the filter through the backwash manifold. Compressed air is introduced into the element interior during backwash to assist with cleaning. There is no need to stop flow during the backwash. The F160206 trial filter and the compressor skid will be delivered on a flatbed lorry with a hiab for offloading onto a flat level base. The filter operates fully automatically and does not usually require any manual input. Closing of the inlet valve to each element can be manually initiated using the HMI on the control panel to accommodate cloth inspection or replacement. The only maintenance required during a trial should be the draining of the compressor/dryer air lines. Should the cloth be exposed to excessive solids, causing fouling beyond the ability of a normal backwash cycle, the filter elements may need to be removed. This can be achieved from ground level using the manual winch provided. Jacopa Product Manager, Nathan Longhurst said, “Valuable experience is gained and performance is demonstrated when operating a pilot-scale plant. We are confident that the evaluation of this innovative technology through site-based pilot trials will prove its viability and justify its adoption”.